Come on an adventure with Aquascene as they share with you this beautiful Island they have called their home for over 30 years. One of Queensland's Signature Tour Experiences, Aquascene are renowned for their exceptional tour experience. 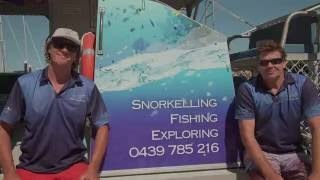 They offer their guests fun, personalised and informative tours that combine snorkelling, fishing and exploring beautiful Magnetic Island.....suitable for absolutely everyone! Discover secluded beaches and bays, snorkel fringing coral reefs and meet some local wildlife, above and below the water. Benefit from expert tuition for snorkelling in a safe and comfortable environment from people who understand individual needs. Your Skipper is also a qualified patrolling lifeguard. Small group sizes ensure a personalised tour experience. Aquascene's custom designed boat provides plenty of shade and comfort, easy access stairs in and out of the water and a toilet/change room. They are also suitable for guests who may have mobility challenges. There are no long travel times, just plenty of fun and relaxation. From the moment you arrive, to the moment you leave you will be looked after by the friendly caring team that Aquascene are renowned for. Join Aquascene on their Discovery Tour of beautiful Magnetic Island. Let Steph and Adam from Aquascene share with you this special Island they have called their home for over 30 years. Visit secluded bays and beaches, snorkel fringing reefs and meet some local wildlife, above and below the water. Swim in secluded bays, come and go from the boat as you please as you snorkel beautiful fringing reefs, relax with a delicious morning or afternoon tea and experience all the beauty of Magnetic Island. Experience a lifetime of local knowledge and "secret" spots as you weave your way along the stunning Granite Boulder headlands. Perhaps stop for a spot of "catch and release" fishing if you wish.